Designed in 1912 by architect Sir Edwin Lutyens as a country retreat for three wealthy brothers, The Salutation was immediately recognised as exceptional, and in 1950 it became the first twentieth century building to be granted a Grade l listing. The Arts and Crafts style gardens are an award-winning plant lover’s paradise spread over 3.7 acres and divided into a series of symmetrical ‘rooms’, each with a different purpose, gathered around a unifying theme. The effect is one of endlessly unfolding space, with wonderful surprises presented around each corner. The planting style is a dynamic infusion of old and new. 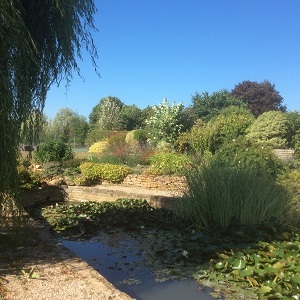 The gardens reveal themselves sequentially through the seasons, and are constantly developing as long-term projects and drawing-board concepts come dramatically to life. Head Gardener Steve Edney will be our tour guide talking guests through fascinating elements of the gardens including the architecturally sculpted shapes within the jungle garden and showcasing the largest private collection of Dahlias in the UK, with over 100 named varieties. *Please note as there is no parking at the hotel, guests will have to use the pay & display car park adjacent to the venue.